With extensive community input, Indy Parks and Recreation completed in December 2017 a visionary Master Plan for Riverside Regional Park. The Master Plan Steering Committee developed a set of guiding principles that will govern the changes to Riverside Park, one of which is to nurture community spirit by integrating the arts in ways that inspire. 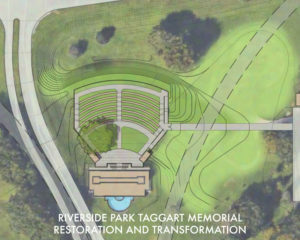 Inspired by the transformative plans for Riverside Park and the exciting opportunity made available through the “Strengthening Indianapolis Through Arts and Cultural Innovation” competitive grant opportunity, Indy Parks, Indianapolis Parks Foundation, Indiana Landmarks, and the Indianapolis Shakespeare Company (Indy Shakes) began planning the first major project that will be implemented under the new Master Plan—restoring and activating Riverside’s historic Thomas Taggart Memorial to be an outdoor amphitheatre, the new home of Indy Shakes, and the inspiration for additional programming. This new Taggart Memorial Mainstage Amphitheatre (Taggart Amphitheatre) will be the place-making anchor for breathtaking arts activities that will play a huge role in transforming Riverside Park, the Riverside neighborhood, and the City of Indianapolis in exhilarating and innovative ways. 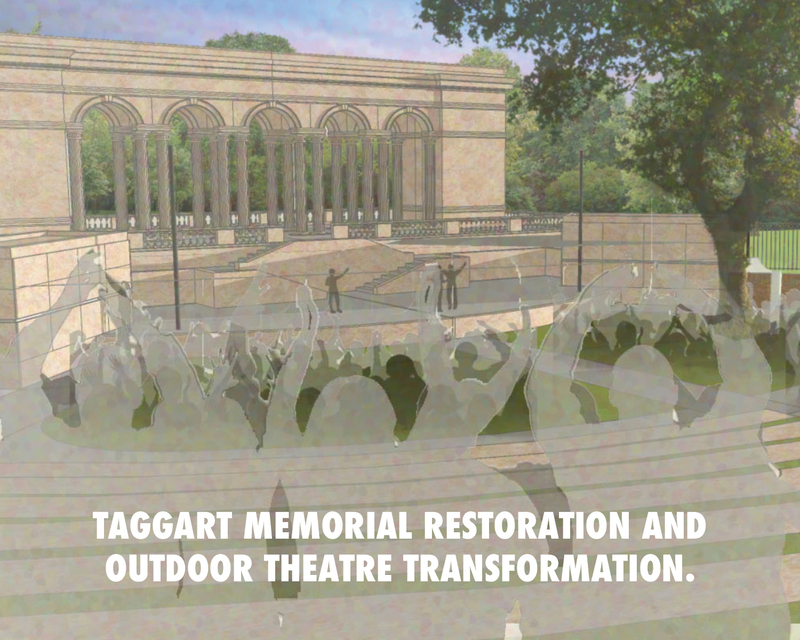 Restore, honor, and transform the Taggart Memorial to include a professional Mainstage Amphitheatre that will be the new home of Indy Shakes, Central Indiana’s only professional “Shakespeare in the Park” Company. Infuse Riverside Park with multiple opportunities for the local neighborhood, Indianapolis residents, and tourists to experience live theatre, musical concerts, and movies in the park through Indy Shakes’ seasonal performances (12 performances over four weekends, serving 10,000) and weekly musical concerts and movie events (54 events over the summer serving 21,600) as part of Indy Parks’ popular summer concert series. Spur the re-development of Riverside Park through creating a new cultural amenity that is aligned with the Master Plan’s strong focus on creativity, innovation, and art as the heart of all future development in the park. 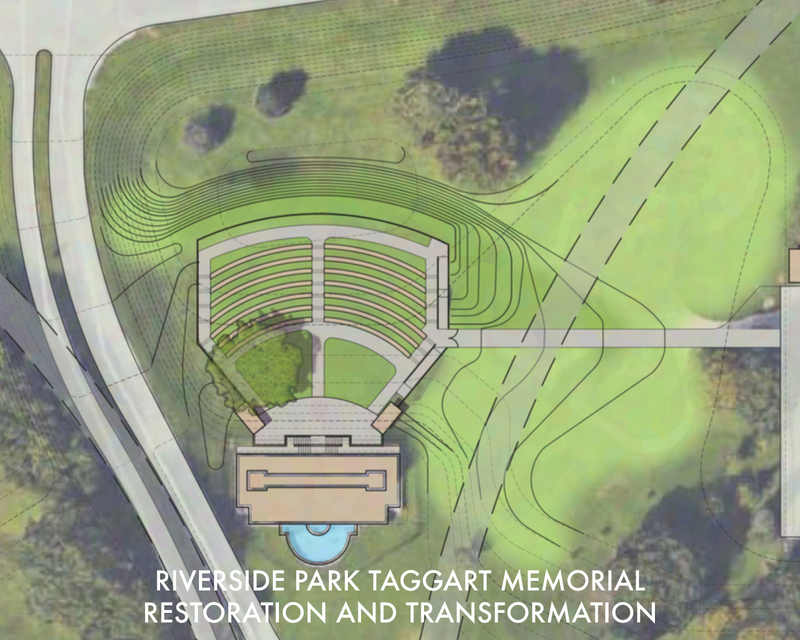 Encouraged by the momentum of this project, the city is investing in the design of the transformative Riverside Promenade in 2019 that will stretch from 18th to 30th Streets along Riverside Drive, west of the Taggart Memorial, creating a welcoming entry into the park. Projected Timeline – The proposed grant period is January 1, 2019 to December 31, 2021, with more than 90% of the budget being spent in 2019 with the restoration of the Taggart Memorial and construction of the amphitheater. Jan. to April 2019 – Project design and permitting from Jan. to March followed by bidding and signing contracts in April. May to Dec. 2019 – Construction of the amphitheatre and preservation of the monument will happen simultaneously, both of which are scheduled to be completed by the end of 2019. This allows for landscaping to be completed in the spring of 2020. June 2020 – The amphitheatre will open by June 2020, and Indy Shakes’ and Indy Parks’ programming will commence as described in this proposal. Indy Shakes’ productions typically occur in July and August. 2021 – This year will be similar to the programming cycle of 2020, with the fall of 2021 dedicated to analyzing the programming successes and challenges and to develop a plan for sustainability.